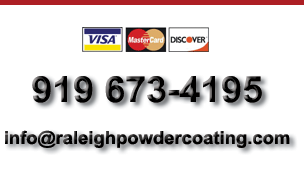 Welcome to Raleigh Powder Coating Co.
We are uniquely suited to handle your most demanding finishing needs. Our small size, experience, personalized service, and technical knowledge allows us to take on jobs that bigger shops seldom accept. Our goal at Raleigh Powder Coating is to provide you with outstanding personalized service, no matter how small, unusual or difficult the work may be. Most finishing companies focus on size and volume, while our focus is to satisfy all of our customer's needs. Regardless of your product's size, value, complexity, or completion deadline, quality always remains job one. Bring us your classic car parts, custom furniture, lawn sculpture, nautical accessories, or any other intricate job. You'll receive the same commitment to excellence every time.When choosing a powder coating company, size should be considered. At Raleigh Powder Coating, we keep a small but technically proficient staff in our 4,000 square foot shop, so your parts are carefully supervised through every step of the process. Powder coating is a completely dry finishing technique used on thousands of consumer and industrial goods. The automotive and maritime industries, appliance makers, architects, and builders all rely on powder coating for its decorative and protective properties, which include a lustrous shine, outstanding color selection, and a durable, long-lasting finish. Powder coating is smoother, longer lasting, cleaner, less expensive, and more ecologically friendly than any other finishing technique. No toxins or aerosols are used. Unlike other metal-finishing techniques that depend on chemicals and solvents, powder coating uses electrically charged and finely ground pigments and resins that adhere to your parts surface. That part is then heated in a curing oven, which bonds the powder to its grounded surface to produce a smooth, even finish. You're left with a beautiful, uniform coat that looks like paint but is many times stronger. Most people don't realize the staggering number of products that take advantage of powder coating's unique benefits. Metal furniture, baby strollers, office supplies, lighting fixtures, and appliances are just a few of the everyday items that feature powder coated protection. Copyright 2017 Raleigh Powder Coating Co.